For more than three decades the public has been fed lies, half-truths and misinformation. Now -- despite government attempts to halt the publication of this volume -- the complete, shocking story can be told. Read the book they tried to ban! A “journalistic” approach to the Third Doctor era. Ranges from Spearhead From Space to just before The Sea Devils. The book has been serialized on the New Zealand Doctor Who Fan Club website. Young Kiwi tabloid journalist James Stevens started in the business on the day of Kennedy’s assassination, and has never looked back; in fact, he’s moved from New Zealand to England, married the daughter of the disapproving Lord Howarth just to cause a stir, and has begun making a name for himself at the Daily Chronicle. One day, he receives a tip from a porter at Ashbridge Cottage Hospital, claiming that a man with inhuman blood has been brought in following a recent meteorite shower. The press is refused entry to the hospital by Brigadier Lethbridge-Stewart of the United Nations Intelligence Taskforce, and Stevens returns to London to write a story about the government cover-up of the meteorite shower, ignoring the drunken man he meets in a bar, Sam Seeley, who claims to have found one of the “thunderballs”. When the story is published, he finds that all mention of UNIT has been excised from it; nevertheless, he receives an anonymous call commending him on his work, and claiming that there is still more to the story. Before Stevens can follow up on this claim, however, London is crippled by “Black Tuesday”, a terrorist attack during which hysterical members of the public report seeing window dummies come to life, and he forgets about the mysterious call for the moment. Some time later, a mysterious plague hits London, and Stevens receives a call from his anonymous source directing him to a research centre on Wenley Moor. Stevens calls the centre and is surprised when the phone is answered by the mysterious Brigadier Lethbridge-Stewart, who hangs up when he realises he’s speaking to a journalist. Although the plague is quickly contained, Stevens’ interest has been piqued, and he determines to investigate further when he spots the Brigadier in the background during a broadcast regarding the return of Mars Probe 7. While interviewing Ralph Cornish of the Space Centre on the state of British scientific development, Stevens questions him about the impact the death of electronics magnate Tobias Vaughn has had on the scientific community -- and Cornish refuses to answer him, directing him instead to Vaughn’s former associate Ashley Chapel, or better yet, UNIT -- or Department C19, a name which seems to cause Cornish some concern even as he mentions it. Meanwhile, Stevens is suffering from marital difficulties, and after one particularly bitter argument with his wife he allows himself to be picked up by a beautiful redhead who picks him up at a party after his story on the Wenley Moor incident is published. As Stevens begins to probe into UNIT’s true nature and agenda, he begins to receive harassing phone calls, death threats, and threatening home visits from agents of the clandestine Department C19. He refuses to bow to pressure, however, and keeps collecting stories from those whose paths have crossed UNIT in the past. He dismisses photographer Isobel Watkins’ wild claims that Earth was once invaded by robot men from outer space, but is intrigued by her claim that C-19 deliberately discredited her and forced her boyfriend to stop seeing her for fear of jeopardizing his career in the army; likewise, he takes only what he wants from Greg Sutton while ignoring his unbelievable claim that a green slime from the centre of the Earth transformed research scientists into wolf monsters. He has soon collected enough material to write his piece, an exposé of a shadowy organisation with a suspiciously vague mandate to protect mankind from “outside threats”. And then there’s the matter of “the Doctor”, the mysterious figure who’s appeared at such various events as the Shoreditch Incident, the C-Day fiasco, the death of Tobias Vaughn, and the Wenley Moor incident -- each time with a different face. Convinced that “Doctor” is a code name for a number of agent provocateurs, Stevens wraps up his article with a demand that the public be informed of UNIT’s true agenda. On the day the article is to be published, however, it is yanked without ceremony, and Stevens is called into the editor’s office and given a generous offer to forget all about the incident. He stands up for his principles, and is dismissed without a severance package, charged with a breach of journalistic ethics, and told that he will never work for another major newspaper again. When he returns home, he finds that someone has given his wife photographic proof of his earlier one-night stand, and that she has returned home to her father. Stevens tries to contact her, but Lord Howarth has him beaten nearly to death and threatens to kill him if he shows his face near her again. Having lost everything, Stevens determines to make good of the situation by exposing UNIT for the corrupt threat that they are. Stevens manages to get his career restarted as a freelancer, and eventually strikes a book deal based on his series of articles about the political misuse of scientific technology. The royalties tide him over while he writes a second book; still fascinated with the legend of JFK, he writes a speculative work suggesting what might have happened if the President had lived. Meanwhile, he continues to collect evidence about UNIT, planning to write a third book which will expose the organisation and its secrets. 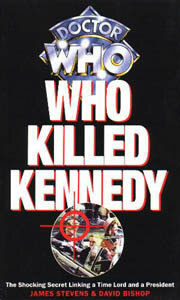 He gets a lucky break when a contact gets him into a press viewing of the experimental Keller Process at Stangmoor Prison; there, he sees a white-haired man called “the Doctor” who is observing the process on behalf of UNIT, and leaves convinced that he’s just witnessed a government-sanctioned experiment in mind control. Shortly after he departs from the prison, a riot breaks out and is subdued, not by the guards or the local police, but by UNIT troops. Stevens writes a piece about the government’s secret experiments in mind control, and at the end of the article, he invites anyone who has knowledge of such experiments to contact him. This is how he meets a homeless woman named Dodo Chaplet, who suffered from a nervous breakdown during C-Day, a failed attempt to connect all of the world’s computer networks to a central system in the Post Office Tower. She is unable to remember what happened to her that day, but ever since then she’s suffered from inexplicable memories of one-eyed reptile men, Wild West gunfighters and games with living dolls. She was shuttled from one hospital to another, nearly raped by psychotic patients in one, given electroshock therapy in another, and eventually abandoned in a facility called the Glasshouse. There, its brutal director questioned her repeatedly about a doctor, or “the Doctor,” and eventually expelled her to the streets, still mentally unstable and no longer able to recall even where the Glasshouse was located. As Dodo tells her story, Stevens comes to realise that she is still a bright, intelligent young woman, despite the grievous traumas she has suffered. He eventually offers her a job taking care of his home while he conducts research and writes. They soon become friends, and eventually lovers. Stevens awakens from a savage beating to find himself locked up in the Glasshouse. Ostensibly a military hospital where traumatised soldiers are brought for medical and psychological treatment, it has long since been infiltrated by Victor Magister, who has turned it to his own ends. Magister is the brutal director who tortured Dodo for information on the Doctor, and when Stevens hears Magister’s voice, he realises that this is the anonymous tipster who first set Stevens off on his crusade against UNIT. The Master had hoped to use Stevens as a pawn to stir up trouble for UNIT, but Stevens has gone too far and now threatens to expose the Master’s ties to C-19. Before the Master can dispose of him, however, Stevens manages to escape with the help of a fellow inmate, Francis Cleary. A young soldier who joined UNIT expecting it to be a cushy anti-terrorism detail, Cleary began to suffer from guilt after killing a prisoner in the Stangmoor Prison riot, feared for his sanity when he saw an alien kill one of his friends at the Nuton Power Complex, and finally went mad after seeing Satan himself in a church in Devil’s End. Stevens helps Cleary back to London, where the frantic Dodo is delighted to see that he’s all right. Stevens contacts his friend Vincent Mortimer, a TV producer who works for BBC3, and arranges for a special edition of The Passing Parade to expose the secrets of the Glasshouse. While he leads a camera crew to the Glasshouse, Cleary remains in the studio, but he simply rambles about having a mission to save the world by preventing a good man from dying, and wanders off when the producer cuts away from him. The stunning conclusion of the programme, however, comes when Stevens leads the crew through the doors of the Glasshouse -- to find an empty building which has apparently been abandoned for years. Humiliated on live television, and having apparently ruined Vincent’s career as well, the shocked Stevens returns home to find that in his absence, Dodo has been murdered. Since he was on live television at the time of her death, he is absolved of her crime, but when he returns home he finds an odd metal ring on the floor and recognises it as Cleary’s. Cleary must have been under the Master’s influence all along; it was he who murdered Dodo, and to make matters worse, she was pregnant when she died. Emotionally shattered, Stevens spends a week at a seaside resort sinking into despair, until he sees a television news report indicating that UNIT is providing security for another peace conference at Auderly House. Determined to avenge UNIT and reveal the truth about UNIT, Stevens heads for Auderly House to expose Brigadier Lethbridge-Stewart’s true agenda by any means necessary. Just as he arrives, he sees the delegates being evacuated, and when he tries to get closer he is attacked by a monstrous ape-like being -- and is saved by the Doctor, whom he recognises from Stangmoor Prison. The house then explodes, and in the aftermath, Stevens is recognised and taken to Brigadier Lethbridge-Stewart for questioning. The Brigadier takes Stevens to a tent where an autopsy is being conducted upon one of the ape-like Ogrons, and Stevens realises that this is a genuine extra-terrestrial creature. Stevens returns to his hotel, now understanding that nobody was ever covering up an evil conspiracy; the truth was simply held because nobody would believe it. All the time that Stevens thought he was on a crusade for the truth, he was actually serving as Magister’s pawn, causing trouble for an organisation whose only agenda was to protect the world from outside threats. Now, his life has been destroyed, his lover has been murdered, and he has nothing to show for it. Just as Stevens is about to kill himself, he gets a desperate call from the Doctor, who recognised him from the television and has been trying to contact him ever since. The Master, who is obviously not under secure lock and key after all, has been using the Glasshouse to brainwash traumatised UNIT soldiers such as Cleary and turn them into his pawns. Armed with Time Rings like the one which Cleary left in Stevens’ house, the Master intends to send an army of time-travelling assassins out to kill important historical figures and shatter the structure of the time-space continuum. The Doctor believes that Cleary is going to kill Lee Harvey Oswald, thus preventing the assassination of President Kennedy and causing a historical embolism which could erase the Doctor himself from existence. It’s too late for the Doctor to stop him, but Stevens may still have a chance to save the world. Following the Doctor’s instructions, Stevens operates the Time Ring which Cleary left in his house -- and is transported to Dallas on 22 November, 1963. Stunned by this final revelation, Stevens drops the rifle and takes Clearly back home with the Time Ring, leaving Oswald to his fate. The Time Ring, a low-powered prototype, barely gets them both back in one piece, and Clearly suffers brain damage and is taken to hospital, leaving Stevens with no proof of his incredible story. However, he’s learned enough to let it go. In the years which follow, he slowly pieces his life back together, and becomes a teacher of journalism, educating such bright young students as Ruby Duvall and Sarah Jane Smith. Eventually, after the death of Natasha’s father, he is able to speak with her and is reconciled with his estranged son. Having atoned for the errors of his youth, decades later, he writes his memoirs and prepares to fulfill his destiny -- by using the flawed Time Ring to go back in Time once again, and, just as he saw himself do, shoot Kennedy and put history right. In addition to the numerous continuity references in the text above, BBC3 was introduced in The Dæmons, and Alex MacIntosh and The Passing Parade were first seen on Day of the Daleks. Also, the Seventh Doctor may make a cameo appearance after Dodo’s funeral, although the “small, dishevelled man with an air of sadness” is never explicitly identified. Department C-19, which is heavily expanded upon in this story, was first mentioned briefly on-air in Time-Flight.